Ignatius Donnelly was [amongst other things] a Catastrophist who [like Immanuel Velikovsky 70 years later] wasn’t destined to become an Authorised Academic Oracle. Ignatius Loyola Donnelly (November 3, 1831 – January 1, 1901) was a U.S. Congressman, populist writer, and amateur scientist. He is known primarily now for his theories concerning Atlantis, Catastrophism (especially the idea of an ancient impact event affecting ancient civilizations), and Shakespearean authorship, which many modern historians consider to be pseudoscience and pseudohistory. Donnelly’s work corresponds to the writings of late 19th and early 20th century figures such as Helena Blavatsky, Rudolf Steiner, and James Churchward, and has more recently influenced writer Graham Hancock. Donnelly’s writings on Atlantis have been rejected by scholars and scientists. He has been described as a crank and pseudoscience promoter. His first major work in 1882 was Atlantis: The Antediluvian World which can be read on-line at Archive.org. His next book was just as startling. In Ragnarok, Donnelly argues that an enormous comet hit the earth 12,000 years ago, resulting in widespread fires, floods, poisonous gases, and unusually vicious and prolonged winters. The catastrophe destroyed a more advanced civilization, forcing its terrified population to seek shelter in caves. As cave-dwellers, they lose all knowledge of art, literature, music, philosophy, and engineering. He cites as evidence 900-foot-deep cracks radiating out from the Great Lakes, and stretching for many miles away. If ice sheets could produce such cracks, he asks, why haven’t similar cracks been found anywhere else on the globe? He adds to this a discussion of surface rocks in New York City, which seem to have undergone a radical chemical change – the feldspar has been converted into slate and the mica has separated out from the iron, as if they had undergone tremendous heat and pressure, as they likely would in the event that a comet struck the earth. He rules out other theories that could have caused this, such as nitric acid and warm rains, by pointing out that this is an isolated incident, whereas warm rains can occur at any time and place and there’s no archaeological evidence for the nitric acid’s origins. He points out many legends and myths from various cultures, such as Zoroastrian, Pictish, Hindu, and Ancient Greece, that are all suggestive of a comet striking the earth, the earth catching fire, poisonous gases choking people, and floods and tidal waves swamping large areas. He also points out early culture’s tendency to heliotheism, which evolved from an insane gratitude to the Sun, after so many horrific days without it. Afterward, the world will resurface anew and fertile, the surviving and returning gods will meet, and the world will be repopulated by two human survivors. It is as well the end of the world, and the start of eternal winter. Ragnarök is an important event in the Norse canon, and has been the subject of scholarly discourse and theory. It simply means ”Mighty Winter”. This mythology might be related to the extreme weather events of 535–536 which resulted in a notable drop in temperature across northern Europe. 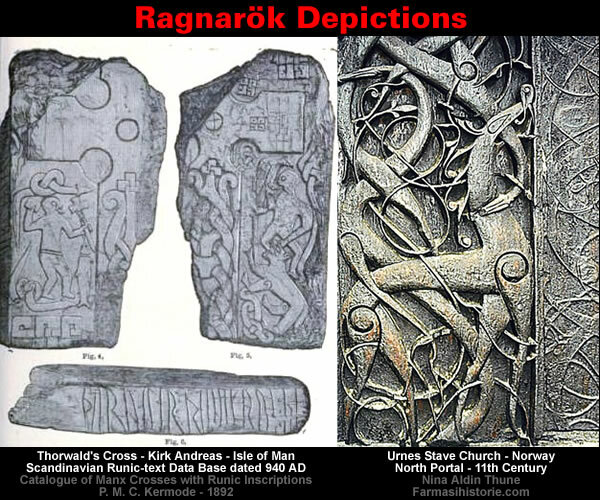 There have also been several popular ideas about whether or not this particular piece of mythology has a connection to the climate change that occurred in the Nordic countries at the end of the Nordic Bronze Age dating from about 650 BC. Before this climate change, the Nordic countries were considerably warmer. Unfortunately, the mainstream has been busy forgetting all about “the incontrovertible elements of the problem” that were identified by Ignatius Donnelly in 1883. 3. Great evaporation of the seas and waters. 5. An age of floods and snows and ice and torrents. Find a theory that explains and embraces all these elements, and then, and not until then, throw mine aside. Similarly, the mainstream has been busy forgetting all about “the facts revealed by the study of geology” that were identified by Ignatius Donnelly in 1882. WAS SUCH A CATASTROPHE POSSIBLE? All that is needed to answer this question is to briefly refer to some of the facts revealed by the study of geology. In the first place, the earth’s surface is a record of successive risings and fallings of the land. The accompanying picture represents a section of the anthracite coal-measures of Pennsylvania. Each of the coal deposits here shown, indicated by the black lines, was created when the land had risen sufficiently above the sea to maintain vegetation ; each of the strata of rock, many of them hundreds of feet in thickness, was deposited under water. Here we have twenty-three different changes of the level of the land during the formation of 2000 feet of rock and coal ; and these changes took place over vast areas, embracing thousands of square miles. There can be no question that the Australian Archipelago is simply the mountain-tops of a drowned continent, which once reached from India to South America. Science has gone so far as to even give it a name ; it is called “Lemuria,” and here, it is claimed, the human race originated. thickness of 45,000 feet – are deposited, that they came from the north and east. ” They represent the detritus of pre-existing lands, the washings of rain, rivers, coast-currents, and other agencies of erosion ; and since the areas supplying the waste could scarcely have been of less extent than the new strata it formed, it is reasonably inferred that land masses of continental magnitude must have occupied the region now covered by the North Atlantic before America began to be, and onward at least through the palaeozoic ages of American history. Gallery | This entry was posted in Astrophysics, Books, Catastrophism, Earth, Geology, History, Solar System, Uniformitarianism. Bookmark the permalink. No cometary Venus, 12,000 years ago! c.5,000 years ago, Adam was expelled from Eden. Red star. Venus came as a comet, possibly 1,360-2,500 years ago. Yellow star.